Twice a week I take horseback riding lessons. I pull my car up the steep driveway to the horse barn, sending a cloud of dust behind me. I am in a charged state of mind from trying to understand whatever crises the morning brought to my home. I climb up onto my horse, and suddenly I don’t understand anything at all about what I’m supposed to be doing. Let me tell you about the horse. First, he isn’t actually my horse, I just like to pretend that he is. His name is Stefano, Stef we call him. He is reddish brown, like cherry wood. His mane is thick and black and strong. I grip that mane when I’m sliding off. He is some kind of German breed I should probably know the name of and he weighs maybe a thousand pounds. Stef’s gaze contains patience. His gait contains dignity. His feet are huge like dinner plates and contain stability. His legs are long and knobby. They have all the power, like writing pencils. When he comes to a trot, it feels like riding in a boat that is hydroplaning out of the water. One of us in that moment is graceful and free. I don’t know what I’m doing. I’m a beginner. Stef knows it. No point in posturing as anything else. I’ve never been very flexible, and this sport is murder on my inner thighs. “Ten minutes a day of yoga is all you need,” the horse trainer Emma tells me. “I’m not really a yoga person,” I say, clenching my jaw. My teeth are gritted because I so want to get this right. 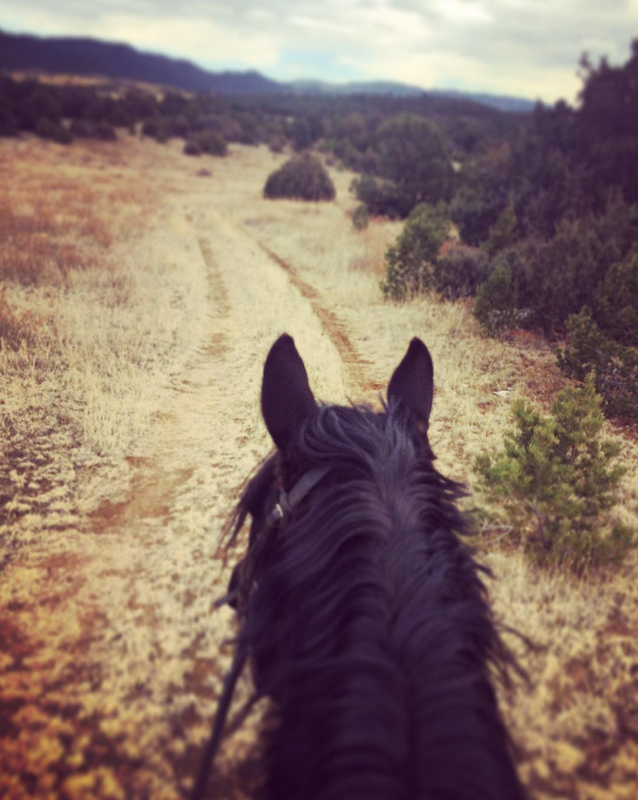 There is so much to remember: my seat, my balance through the core, weight in the lower leg, heels down, shoulders back, hands in front, hands low, lower, reins taut… it goes on. I’m concentrating. My jaw is clenched again, and Emma notices. “You’re not seeing the bigger picture,” Emma calls. She points out that I’m trying so hard to get the nuts and bolts right that I’m forgetting to sit back and yes, enjoy the ride. Is this how I do my life? Turn every relationship into a project? “Look around you,” Emma says. I’m ten feet off the ground. Stef is holding me up. The sky is pale blue, the late summer air, dusty. A kettle of vultures soars in slow motion in the shape of a crown that tops the morning. The horse barn sleeps lazily against a hillside that leans away from me covered in ten thousand pines huddled in green forest silence. Save for the wind. It moves against the branches whispering secrets. And I’m simply a woman on a horse. I have taken horseback riding lessons twice before as an adult. Both times I quit. Quitting had something to do with being overwhelmed by how much there is to know. Riding seemed like a project I could never master within the allotted timeline I had unconsciously set for myself. So what was the point? But there came a moment when I had exhausted my old commentary. I became weary of the stories I told myself. And in any case, I love being on a horse. I tried a different way. With Stef I don’t run out and buy fancy riding breeches and boots. I don’t read ten thousand how-to books. In fact, I don’t even think much about riding between lessons. I stop pinning so much on riding, which means that when I go to see Stef, I don’t bring an agenda, I bring only myself. I plunk down off Stef at the end of the riding lesson. My knees are wobbly as I lead him back to the pasture. Sometimes the lesson has been tough, frustrating. Stef leans forward over the fence to be stroked. I reach up to feel his neck and pet his soft nose. I stand back and look at him and think, really? I rode him? He is a giant and a mystery and I rode him? I am in awe, of him and of me.